Who will YOU walk for?! On Sept. 23 and 24, animal lovers across Ontario will walk in the Ontario SPCA Friends for Life! WalkTM presented by Pedigree, raising funds to support vital medical care and safe shelter for animals in need. Will you join us? You can sign up for the walk here. You don’t need to bring a dog to the Walk to participate. You don’t even need to own a pet! The Friends for Life! Walk is a meaningful way for you to give back to your community by helping animals in need. Not able to walk? You can still support animal friends in need with a special gift here. Be sure to follow us on Facebook, Twitter and Instagram to keep current on the latest FFL! Walk news, contests and giveaways. Register and raise a minimum of $100 online before Sept. 4 for a chance to win one of two Instax Cameras. Self-donations count towards your entry. Register now and start raising funds for animals in need! What should you do if you see a pet in a hot vehicle? Every summer, the Ontario SPCA receives hundreds of calls about animals left in hot vehicles. Unfortunately, there are still pet owners who aren’t getting the message about the dangers of leaving pets unattended in vehicles. Parked cars can quickly reach deadly temperatures, even on relatively mild days with the car parked in the shade and the windows slightly open. So what should you do if you come across an animal left in a hot vehicle? Find out in this video with Ontario SPCA Inspector Scott Sylvia. He discusses the dangers of leaving pets unattended in vehicles, consequences for owners and what you can do if you see an animal in distress. Please take the time to support the No Hot Pets message and take the pledge here to show solidarity for this important campaign. In recent years, there have been significant changes in ‎the use of animals in entertainment. People are more sensitized and concerned than ever before about the care and treatment of animals. While the Province of Ontario has taken steps in an effort to keep pace, more can and should be done. The Ontario SPCA believes that having animals on exhibit in zoos solely for commercial gain is an antiquated business model that must be stopped. The time to begin working towards this goal is now, if we work together to ensure our expectations are clear for elected officials. Visit our website to learn more, including our frequently asked questions about animals used in zoos for commercial gain. 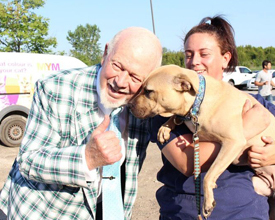 The Ontario SPCA recently welcomed hockey icon Don Cherry who paid a visit to the Society’s Provincial Office in Stouffville to wish a group of pit bulls well on their journey south to find new homes in Florida. In October 2015, the Ontario SPCA uncovered an alleged dogfighting operation near Chatham, Ontario. Several dogs were removed during that investigation and assessed by the ASPCA, world leaders in dogfighting rehabilitation. Seven of those dogs immediately passed the ASPCA’s assessments, but due to lengthy court proceedings remained in the Ontario SPCA’s care until they were recently released from the courts to be rehomed. In addition, one of the animals removed from the alleged dogfighting operation gave birth to 11 pit bull puppies while in the care of the Ontario SPCA. After being spayed and neutered, the first group of these dogs was transported to two facilities in Florida by the Ontario SPCA and a team from Dog Tales Rescue and Sanctuary, which funded the transport. Pit Sisters, a behavioural and dog training program with the mission to find challenging dogs new homes, will be taking 10 of the dogs and Dogs Playing for Life will be taking four of the dogs. By the end of 2017, the Shelter Health Pro website, shelterhealthpro.com, will be almost doubling in size and scope with the launch of the Environmental Needs & Behavioural Health section. You may have noticed the button on the home page with this title. This portion of the Shelter Health Pro website will include material relating to stress reduction and behavioural enrichment for a variety of animals in our care. 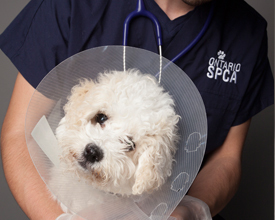 Shelter medicine experts and the Ontario SPCA believe that the physical and medical needs of the animals we care for are just as important as their environmental needs and behavioural health. Stay tuned for website launch announcements. Thanks to families across Ontario who opened their homes and their hearts, 216 cats and kittens were adopted into loving homes during a recent “iAdopt Urgent Appeal” adopt-a-thon. From July 28 to Aug. 6, all cats and kittens were offered at a reduced adoption fee at participating animal centres with the goal of finding loving homes for as many as possible to reduce demands on centre capacities. Thank you to everyone who adopted a new feline friend during the adopt-a-thon. Your support changes lives! If you are able to welcome a cat into your family, there are still many in our care waiting to meet you. 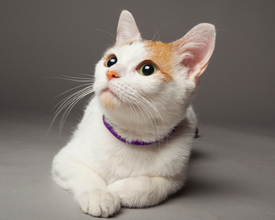 By adopting a cat, you can help ensure space becomes available for other animals in need. We have a beautiful foal in our care, but he doesn’t have a name. 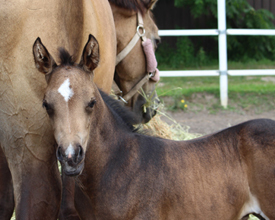 Help us name this cute little colt and you could win. In March 2017, Dee, a Quarter Horse-cross mare, came into the care of the Ontario SPCA through an investigation. When she was examined by a veterinarian, we learned she was in foal. Her baby was born last month and now needs a name. Was this newsletter forwarded to you? Subscribe here to get your monthly Newshound right to your inbox. NewsHound is a free electronic newsletter published monthly by the Ontario SPCA to inform our supporters and friends of animal welfare about Ontario SPCA Community initiatives, programs, events and experiences. Contents of NewsHound may be reproduced with appropriate credit. Ontario SPCA Charitable Business # 88969 1044 RR 0002.